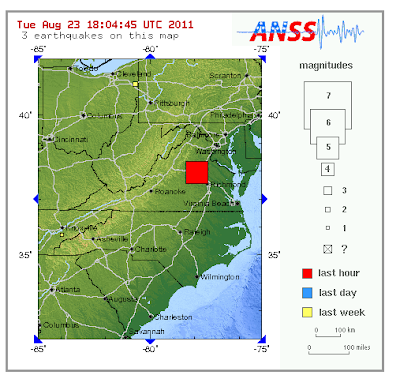 A 5.8 magnitude earthquake, centered in Virginia, southwest of Washington, D.C., occurred at 2:04pm EDT. The quake was strongly felt in D.C. and as far away as central Pennsylvania. VIA www.facebook.com/accuweather , the quake was felt as far away as Massachusetts. Page up on the blog for thoughts on how to prepare for aftershocks.